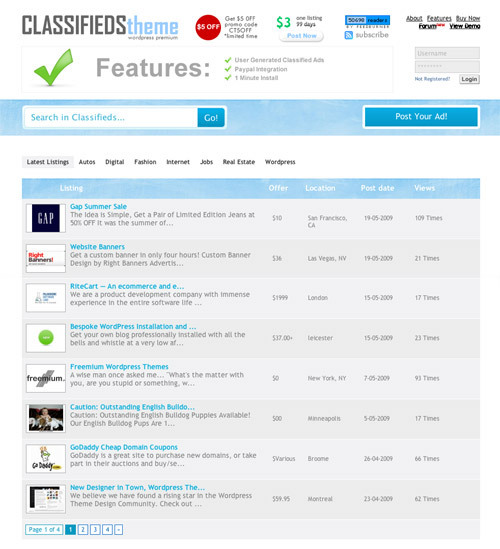 Classifieds Theme is a complete classified ads system for WordPress. 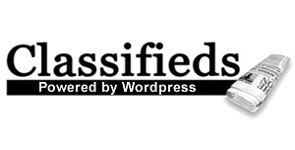 Meaning you do not need to adapt your current site using a wordpress classifieds plugin. According to the publishers of the theme it ‘allows anyone to easily turn a standard wordpress blog into a powerful community driven classified ads serving platform’ its basically a piece of classifieds website software. The look of the theme is very basic and if you are running a classified ads site or want to take your classifieds online then this is a very good thing indeed. You need the focus of your site to be your customers ads not the surrounding graphics and banners, this theme achieves this very well. The ads are nicely separated with alternating background colours, and can easily catagorised and tagged by the customer, making them easy to find by visitors. charges its users $3 per 99 days for each advert. You can easily change this to any amount you want, we would recommend using a $1 / £1 per 14 days ratio for maximum profit and affordability. All payments are collected via paypal and there is no need for your customers to go through the annoying join / sign up process before they can place an ad. However if you are an avid mailing list collector then there is plenty of opportunity for your customers to sign up. The scope for this theme is huge. For example coupon code and promo code sites are becoming big business in the current economic climate and this theme is perfect for that use, it already looks very similar to a lot of the major players sites. Free classified websites like Gumtree, Freecycle and Craigslist are some of the biggest in the classifieds market and although they offer many of their postings for free they make up the rest of their income from on site advertising. Why not use this theme for a similar use? 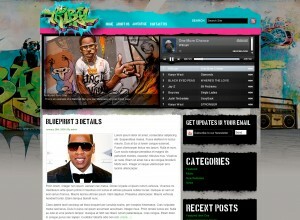 It has built in adsense and plenty of banner space. See what we mean? 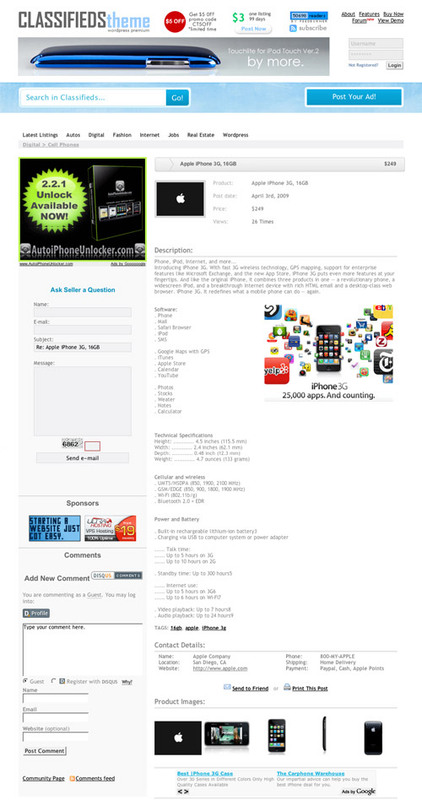 This is a serious tool and it is very intuitive, for instance take a look at the individual ad page for an iPhone below. See how the banners and Adsense have changed to be relevant to the product the seller is advertising without disturbing the look of the theme or becoming dominant over the sellers ad. The one thing we would change here is the positioning of the product images. They are too far down the page and need to be close to the top to become more of a feature. This is a big shame because when clicked the product images open full screen in a lightbox style gallery overlay with easy navigation to browse all the different angles and views the seller has uploaded. Note that this page also has an ‘ask the seller a question’ form as well as a comments form. Both very important when building a classifieds community. If you do run a classifieds based business (or similar) then you really need to consider this theme if you want to maximise your profits and make usage easy for your customers. If you already have a website then this should be a big wake up call to upgrade if your existing site does not meet the full spec of this one. Buying this theme reveals an interesting option. As well as the usual single license and multi user license (if you wish to install on more than one site). The developers also offer a reseller option. If you are a web developer, sell themes or simply have many clients who would be interested in this theme then you can pay a one off fee and then resell the classifieds theme for as much as you want and as many times as you want. You can also redevelop it and sell it with no comeback. Click here to see all the different options available. If you are not a developer and simply need this theme installed for you then please click the ‘install’ link below. 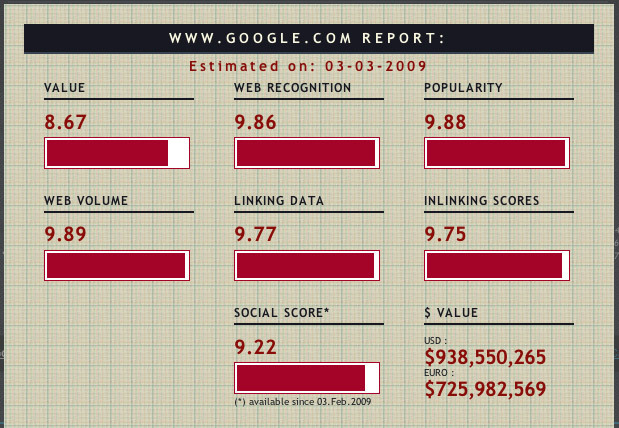 After a playing around with $timator the cool new ‘whats my website worth’ tool we noticed that Google.com was topping the charts at an unbelievable (but not surprising) $938,550,265! That puts WordPress second in the running and closing in fast on Google. 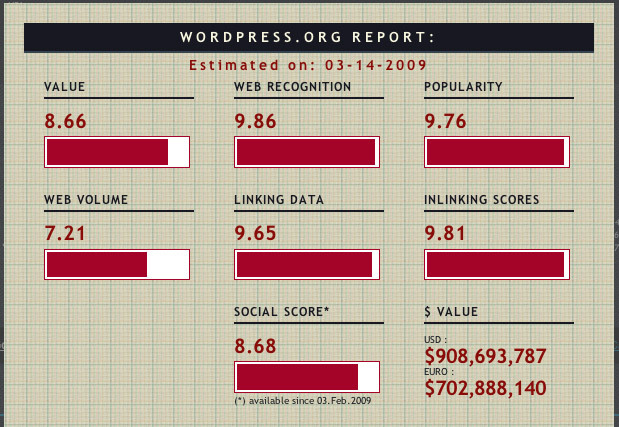 Not just on physical value, thats not what $timator is about, but web recognition and popularity. 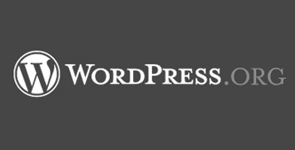 All we can say is ‘well done WordPress’ and ‘thank you’.